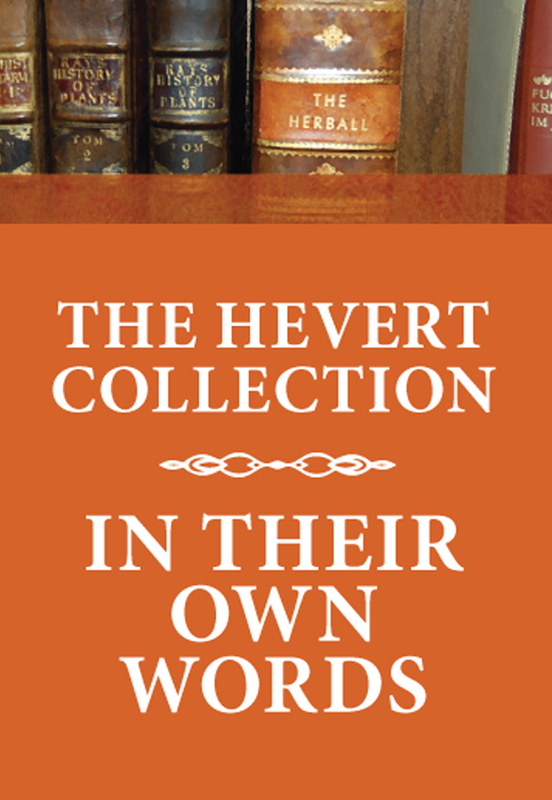 Select six volumes of the Hevert Collection for only $139.00! Six titles, your choice! Make your selection on the checkout page. A historical overview drawn from the Benedict Lust journals published between 1900-1923. These classic articles, meticulously researched and selected, frame the key clinical and professional issues that have affected naturopathic doctors to this day. Preview. In choosing the philosophy of naturopathic medicine, the naturopath recognizes that nature is inherently wise—and that abiding by its laws, we can reinforce and sustain physical and mental health. The naturopathic movement was founded by pioneer Benedict Lust and led by him through 50 years of publishing advocacy and patient care. Preview. What we choose to eat is arguably the most important factor in producing and sustaining health. Diet was a cornerstone for the early naturopaths as they charted a course for health reform. This volume is a review of the writings of these early naturopaths who scrupulously examined and documented the role of diet and food. As important today as when these pioneers first brought forward their discoveries into clinical practice, their dietetic knowledge is a precious resource for the modern naturopath. Preview. 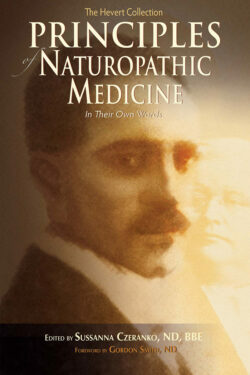 The six contemporary naturopathic principles began as 12 in 1902. This book helps contemporary naturopaths understand how their principles transformed over time. 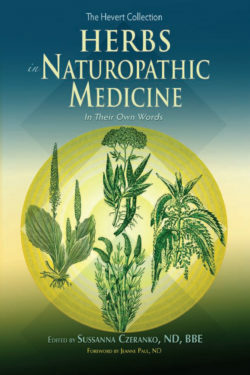 Understanding the roots and evolution of the naturopathic principles is critical to ensure the success and unique character of naturopathic medical practice. Preview. Discover the very best of naturopathic pioneers’ clinicalpractices. This book explores their modalities and methodologies used to guide patients to renewed and sustainable health, ranging from heliotherapy, Nauheim baths, bloodless and orthopedic surgery, earth cure, water cure, botanical medicine and dietetics. Preview. The topic of vaccination is fraught with intrigue and complexities. Since vaccinations’ first appearance in Western medicine, the controversy between those warning of its dangers and those espousing its utility has endured. Perhaps no professional body has been more consistent in articulating its concerns than the naturopaths of the early 20th century. Indeed, the issue of vaccination safety and efficacy has a special place in the history of naturopathy not only because of the strong energies, convictions and polarities it conjures, but also because the very issue galvanized the early naturopaths and helped shape the profession. Preview. Early 20th century naturopathic doctors recognized the “Physical Culture” movement, championed by Bernarr Macfadden, as a powerful tool for promoting health. Its goal was to mobilize people to get active to get healthy. Naturopaths and Physical Culturalists alike eschewed sedentary lifestyles and the oppression of women, instead encouraging liberating knowledge about women’s and men’s health, sunshine, fresh air, wholesome food, connection to the earth and hydrotherapy. The Physical Culture movement is still with us. Some different terminology; the same powerful, effective principles. Preview. We can trace the central role of herbal medicine in North American naturopathic practice back to Benedict Lust, who introduced the rich legacy and tools of Father Kneipp to his American colleagues more than a century ago. Their apothecaries consisted of common, every day herbs, yet, their applications and use are surprisingly more comprehensive and daring than we can imagine. Herbs in Naturopathic Medicine pulls back this historical curtain and invites us to peek into the naturopathic herbal armamentarium of the very early 20th century. Preview. Become reacquainted with the prescient voices of those who wrote about mind-body medicine at the very inception of naturopathy. The resounding teaching in this book is that the body and mind are one, and more importantly, that the mind and the spirit absolutely matter in overall health. The use of water for healing and health is the very foundation of naturopathy. This book gathers together the extraordinary water therapies celebrated in Benedict Lust’s publications from 1897 to 1923. These two volumes address many of the early naturopathic protocols for their successful treatment of life-threatening diseases and for health promotion. What is remarkable to rediscover is the great confidence the early NDs had in these practice treasures, as useful and powerful today as they were a century ago. A peek into the naturopathic herbal armamentarium of the very early twentieth century. 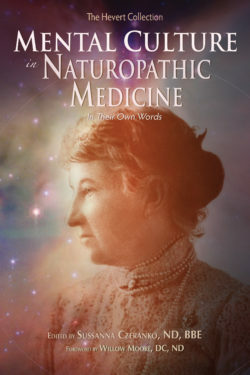 The prescient writings about mind-body medicine at the very inception of Naturopathy. 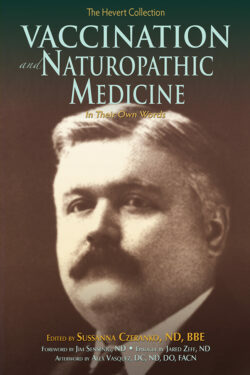 The transformation of the six contemporary naturopathic principles that began as 12 in 1902. Vaccinations have been controversial since they first appeared in Western medicine.